January 1 – Ohio State defeats USC in the Rose Bowl to win the national college football championship for the 1968 season. Australian media baron Rupert Murdoch purchases the largest-selling British Sunday newspaper, The News of the World. People's Democracy begins a march from Belfast to Derry City, Northern Ireland to gain publicity and to promote its cause. January 4 – The Government of Spain hands over Ifni to Morocco. Ariana Afghan Airlines Flight 701 crashes into a house on its approach to London's Gatwick Airport, killing 50 of the 62 people on board and two of the home's occupants. The Soviet Union launches Venera 5 toward Venus. January 6 – The final passenger train traverses the Waverley Line, which subsequently closes to passengers. January 10 – The Soviet Union launches Venera 6 toward Venus. Led Zeppelin, the first Led Zeppelin album, is released in the United States. Martial law is declared in Madrid, as the University is closed and over 300 students are arrested. American football: The New York Jets upset the Baltimore Colts in Super Bowl III, 16-7. Joe Namath is the MVP of the game. An explosion aboard the aircraft carrier USS Enterprise near Hawaii kills 27 and injures 314. January 15 – The Soviet Union launches Soyuz 5, which docks with Soyuz 4 for a transfer of crew. Two cosmonauts transfer from Soyuz 5 to Soyuz 4 via a spacewalk while the two craft are docked together, the first time such a transfer takes place. The two spacecraft undock and return to Earth two days later. Student Jan Palach sets himself on fire in Prague's Wenceslas Square to protest the Soviet invasion of Czechoslovakia; 3 days later he dies. January 18 – In Washington, D.C., the Smithsonian Institution displays the art of Winslow Homer for 6 weeks. 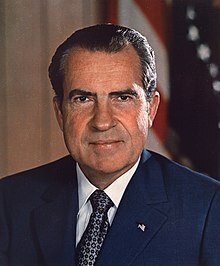 January 20 – Richard Nixon is sworn in as the 37th President of the United States. January 22 – An assassination attempt is carried out on Leonid Brezhnev by deserter Viktor Ilyin. One person is killed, several are injured. Brezhnev escaped unharmed. February 5 – The controversial television show Turn-On premieres on the ABC network in the United States and is canceled after one episode following protests by viewers and ABC affiliate stations. The Allende meteorite explodes over Mexico. After 147 years, the last weekly issue of The Saturday Evening Post is published. The magazine is later resurrected, briefly, as a monthly magazine. February 9 – The Boeing 747 "jumbo jet" is flown for the first time, taking off from the Boeing airfield at Everett, Washington. February 13 – Front de libération du Québec (FLQ) terrorists bomb the Montreal Stock Exchange. February 14 – Pope Paul VI issues Mysterii Paschalis, a motu proprio, deleting many names from the Roman calendar of saints (including Valentine, who was celebrated on this day). The Mariner 6 Mars probe is launched from the United States. Tinker v. Des Moines Independent Community School District: The Supreme Court of the United States rules that the First Amendment to the United States Constitution applies to public schools. Apollo program: NASA launches Apollo 9 (James McDivitt, Rusty Schweickart, David Scott) to test the lunar module. May 18 – Apollo program: Apollo 10 (Gene Cernan, Tom Stafford, John Young) is launched as a full rehearsal for the Moon landing, but stops 15 kilometers short of actually reaching the lunar surface. June 24 – The United Kingdom and Rhodesia sever diplomatic relations, after Rhodesian constitutional referendum. July 16 – Apollo program: Apollo 11 (Buzz Aldrin, Neil Armstrong, Michael Collins) lifts off toward the first landing on the Moon. July 20 – Apollo program: At 10:56 pm ET (02:56 UTC July 21) the lunar module Eagle | Apollo 11 lands on the lunar surface. An estimated 500 million people worldwide, the largest television audience for a live broadcast at that time, watch in awe as Neil Armstrong takes his first historic steps on the surface of the Moon. The Apollo 11 returns from the first successful Moon landing and the astronauts are placed in biological isolation for several days in case they may have brought back lunar germs. The airless lunar environment is later determined to preclude microscopic life. ^ "Manned Space Chronology: Apollo_11". spaceline.org. Archived from the original on February 14, 2008. Retrieved February 6, 2008. ^ "Apollo Anniversary: Moon Landing "Inspired World"". nationalgeographic.com. Archived from the original on February 9, 2008. Retrieved February 6, 2008. ^ "Pope Paul VI's Apostolic Pilgrimage to Uganda, 31 July–2 August 1969". Retrieved October 29, 2016. ^ "1969: British troops sent into Northern Ireland". BBC News. August 14, 1969. Retrieved January 10, 2008. ^ "AIDS Virus Came to US Via Haiti". Voanews.com. Retrieved May 5, 2014.